Eagle is a US-based bicycle manufacturer that focuses on custom-made high-performance professional grade/quality bicycles for road, triathlon, time-trial, and mountain/off-road cycling. 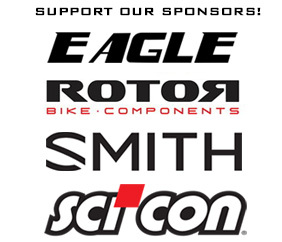 Eagle manufacturers high end components including frame sets, aero drop handle bars and professional carbon-fiber deep-dish aero rims for road, time-trial, and triathlon applications. Eagle is on a mission to build the lightest, most comfortable aero bike available. Eagle worked hard to break the mold in the development of the Z3. Eagle developed a stiff, responsive carbon (FeatherLite) for the Z3 resulting in a bike that is rigid, fast, light, and yet astonishingly forgiving. Following Cervelo’s BBright, Trek’s Kammfoil, and proven architecture/design features found on a number of “super bikes” as benchmarks; Eagle integrated a system of aerodynamics and responsiveness that is all their own. Eagle’s FeatherLite carbon combined with their FLYTEC+ design is a bold statement to the industry. Combine exceptional stiffness, compliance, and aerodynamics at a surprisingly light weight and you have an achievement that Eagle calls the Z3. Eagle provided a custom painted Z3 “Super Bike for Summit4CAD’s inaugural event; the summit of Mt. Haleakala in Hawaii. Summit4CAD Founder Jon Patrick Hyde became the first Widowmaker Heart Attack survivor to cycle to the summit of Mt Haleakala, the longest continual paved uphill cycling course in the world on the 1 year anniversary of his heart attack. ABOVE: Eagle’s outstanding Z3 Aero Road Bike at the summit of Mt. Haleakala (10,023ft) with Summit4CAD Founder Jon Patrick Hyde. I’ve ridden aero TT/Tri bikes for years and have been drawn the evolution of the aero road “super bike”. The issue has been that aero road bikes (along with their TT/Tri counterparts) are very unforgiving in the comfort department due to the rigidity of their design. They are heavier and therefore in applications like climbing a massive mountain the benefit you gain from aerodynamic efficiency is lost in weight. When initially talking with Eagle about my goals for Summit4CAD I told them that I wanted to test the convention that aero bikes don’t make for good climbing bikes. What Eagle delivered to me with my Z3 is nothing less than a revelation. It’s lighter than the top-of-the-line “endurance” bike from another manufacturer. It’s more comfortable than that same endurance frame – a frame that was specifically designed for comfort. It’s incredibly agile and you immediately feel the acceleration when you up your wattage output during your pedal stroke. Conventional wisdom is that you do big climbs with the lightest bike possible. In doing so you loose efficiency because super light weight bikes are not typically aerodynamic. 70-90% of any cycling effort is spent fighting wind resistance and aerodynamic drag. I challenged the conventional wisdom regarding aero bikes for climbs and the Eagle Z3 was the PERFECT machine for my assault on Haleakala. It’s a rare bird – it’s an aero bike that love to climb. BELOW: Summit4CAD’s Founder Jon Patrick Hyde on his Eagle Z3 during his descent from the summit of Mt. Haleakala.